This Floor Cleaner is specially formulated to preserve the quality of your floors while keeping them sparkling clean! This convenient product can be used on all sealed wood, tiles, laminate and hard floor surfaces. The Floor Cleaner is ideal for cleaning whole floor areas as well as spot cleaning dirt, grease and spills. Simply spray onto the floor and wipe clean with a mop or damp cloth. Vegan, cruelty free and carbon neutral. 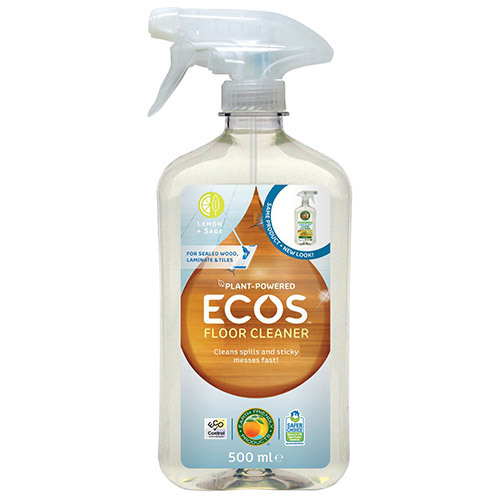 This Floor Cleaner was the winner of Good Housekeeping Institute’s Green Living Award 2009 - `results were excellent on laminate, vinyl and ceramic tiles’. Water, Denatured Alcohol, Potassium Sorbate, <5% Non-Ionic Surfactants, Acetic Acid, Gluconic Acid and Perfume. For spot cleaning, spray affected area and wipe clean with a damp cloth or paper towel. For large areas, turn nozzle to stream, spray entire surface and wipe with a damp mop. Allow to dry. May cause eye irritation. In case of accidental eye contact, rinse with water. If irritation develops, consult physician. DO NOT mix with chlorine type bleaches, chemicals or any other cleaners. Below are reviews of ECOS Floor Cleaner - Lemon & Sage - 500ml by bodykind customers. If you have tried this product we'd love to hear what you think so please leave a review. This Floor Cleaner is specially formulated to preserve the quality of your floors while keeping them sparkling clean!